In a land, far from where I write to you, existed a kingdom filled with joy and prosperity. The old king, Roslow, had died, leaving behind a legacy of kindness and strength to his two sons. Jerome was the elder and Roman was the younger. Jerome had grown bitter towards the end of his father’s life. King Roslow decided that he was unfit to rule and so instead chose to pass his crown to his second born. Roman was kinder than Jerome. He was selfless in his passion for his people and carried the strength to face all those who opposed him, including his brother. Jerome was furious when he learned he had been passed over for the title that was rightfully his. Despite Roman offering him power at court, Jerome was jealous. The Kingdom of Navaria rejoiced at the coronation of their new King. Roman was a once beloved prince and now an adored ruler but a dark blood ran underneath the snow covered land as tensions between the brothers threatened to erupt, bringing me to the beginning of my tale. “He’s drunk again, Majesty,” the king’s adviser, a trusted confidante named Perrin announced discretely. There had been a commotion earlier that morning. Jerome had been fighting again. Roman shook his head as Perrin described the scene Jerome had created in the Great Hall of Castle Kroestov – the ancestral home of Navarian Royalty. “I’ve given him every possible advantage he could have and still he is unsatisfied,” Roman groaned. He wasn’t sat on the throne. Instead he had chosen a more modest wooden chair by one the long windows of the hall. “He doesn’t have every advantage,” Perrin interjected. “He doesn’t have that gold on your head.” Perrin’s long face was saddened. He had watched the prince’s grow into men and it pained him to see Jerome behave with such ingratitude. Roman removed his crown from his mane of curly brown hair. Later that evening, Roman set out for the Hargov Estate where his brother resided. It was a quiet ride along the edge of the forest. He travelled in a plain carriage so as not to draw attention. The gatekeeper at the edge of the lands spied Roman’s fine clothing and the jewels on the fngers suspiciously before realisation came over him. He fell onto his knees in the muddy snow that had been churned up underneath horse foot. Roman climbed from the carriage and placed his hand on the man’s shoulders bidding him to stand. “I saw him ride out a few hours ago,” explained the man with his head lowered. “My lady is home though,” he quickly added. Roman offered a warm and accommodating smile. The driver and the gatekeeper were left behind as the king completed the path alone. Unafraid of assassins so close to the castle known as The Hand given the shape of the five towers that looked like a granite hand against the grey sky. Legend told of the Hand of Hargov being an impenetrable force in great wars. Edward Hargov, king, made it his home . Countess Natalya had married Jerome at her father’s request believing that she would be queen one day. The old Count, a distant cousin in Roman’s family, died. Natalya was granted his titles and rule of the Hand as his only remaining child. When Jerome was denied the crown he became the new master of the Hand. The Hand was a great power within the kingdom but Jerome would not be satisfied until he had his crown. The door opened upon Roman’s arrival. The servants who had spied him approach gathered in the doorway to offer him a warm welcome. Lydia Harrington, the Countess’ maid of honour, curtseyed before the king. The other ladies did likewise. “Good evening, Your Majesty. Welcome to The Hand. It is quite an honour to receive you,” said Lydia. The other girls smiled shyly before scattering off to other parts of the castle to carry out their duties.Roman and Lydia started to make their way to Natalya’s chambers. “She needn’t make a fuss,” Roman assured. “I hope nothing serious,” was Roman’s reply. Lydia patted his arm affectionately. They stopped at a door that led to a small living room in Natalya’s chambers. Lydia knocked and pushed the door open. “A visitor for you, Your Grace,” she said. “Nat? What happened?” he asked with genuine concern. Natalya, a petite woman with flowing blonde hair ran to the king and threw her arms around him. He could feel her tears as she pressed her cheek against his. Lydia quietly stepped out and closed the door, leaving them alone. “What happened?” Roman asked again as she stepped back towards the light of the flame in the fireplace and could see the bruising on her milky, white skin. Her lip was swollen and one eye could barely open. “It’s nothing,” she replied. She crouched by the fire where there was a bowl of warm water. She took the cloth and began dabbing at the bruises. “Someone should help you,” Roman decided. “Did Jerome do this to you?” asked Roman even though he already knew the answer. “I’m his wife,” she replied. Roman frowned. His warm brown eyes flickered with anger. His lips tensed. “Marriage is no licence for this,” he spat. Natalya smiled as best she could manage with lip. She knew the king’s anger was not directed at her. Roman took her hand and kissed it. It was Natalya’s turn to frown. “Don’t be so stupid,” she growled. “I’m serious,” the king insisted. “I can’t leave you hear. Not like this,” said Roman. He took the cloth from her and began dabbing at her lip. She reached her hand up and clasped his. Roman sighed. “Come with me,” he suggested. She could see that Roman’s frustrations were not waning so she reached out and turned his face so their eyes met. Her fingers caressed his soft, neatly trimmed beard. When the king was satisfied he had left her in good spirits he departed. The driver and the gatekeeper noticed his melancholy air when he returned but said nothing. Lydia returned to Natalya. She was watching Roman disappear into the distance. The darkness was thickening and a mist beginning to gather across the low lands. “You didn’t want to go to Kroestov with him?” Lydia enquired. Natalya reached her finger tips to her lip. A wry smile appeared on Natalya’s face. The rest of the series is free to read here at Vivika Widow Online. 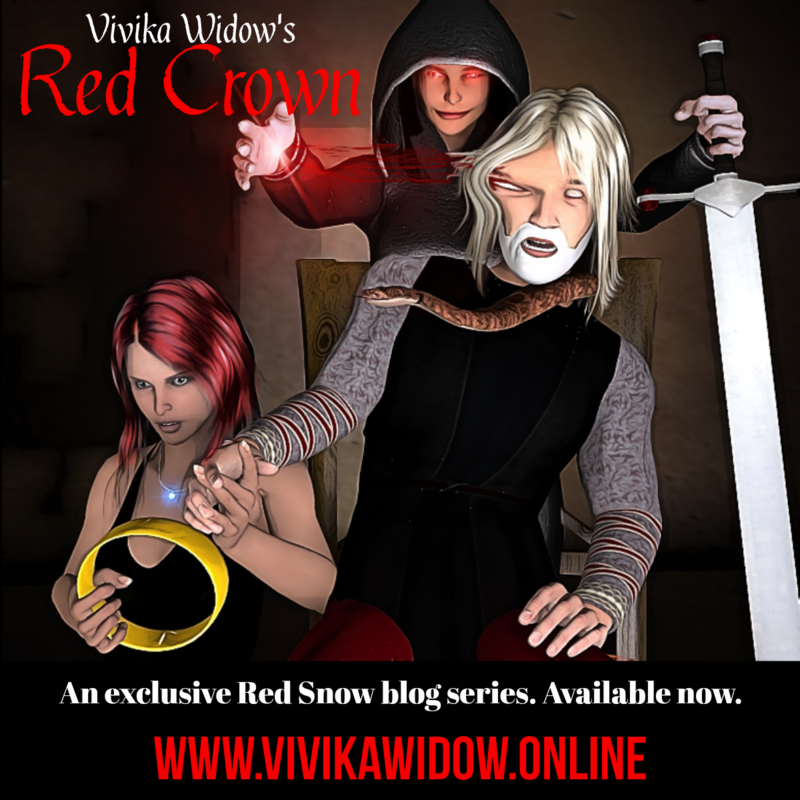 Click HERE to enjoy more magic, murder and mayhem with Vivika Widow’s explosive introduction to the fairy tale world of Red Snow. Previous Ten things you (probably) didn’t know about The Knock, Knock Club series.